Promises are made, and promises are broken. It is unfortunate, but in this time of war this is our reality. The times are filled with darkness and deceit is in the air. Many pacts and truces have been broken since the start of the Beacon wars. It is unknown, even to the Chronicle, how many side deals have been made between the major parties of the war and the smaller leagues that exist across the realm. It is likely that they are numerous, and as you can see from the explosion of new leagues now in possession of Beacons that once belonged to others, this is likely true. Yet not all promises that are made are intended to be kept. Many are broken. One of the most recent was one involving a league that has quickly risen in power and respect: Anarchy, led by a number of veterans from across the realm. The other partner was The Knights Templar, a well-established and prominent member of the ongoing chaos that the realm is currently facing. Deals were made according to the leadership of Anarchy, deals that would see their newly gained seat of power left to its own devices and secure from attacks by the major parties involved in the Beacon wars. Unfortunately for them, this promise was not to be kept. The Knights Templar, led by their Captain Friction, struck out and seized control of Anarachy’s Beacon, wiping their defenders off the map and crushing their hopes in the process. Outraged by the fact that The Knights Templar would break their word, Crusher, a well known name and currently a Captain in Anarchy took to the public forums to vent his frustration. 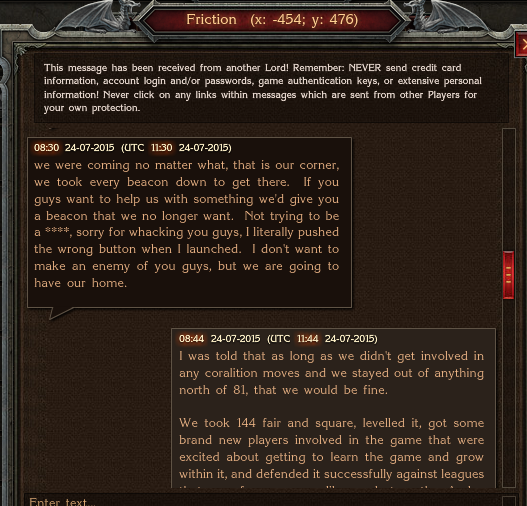 The contents of this message, that Crusher made public to all, shows the talks between himself and Friction, who led the attack on the Anarchy Beacon. A sample of these is presented below and show that Friction believes that this action committed by him and his league was an accident and the blood spilled was by mistake. 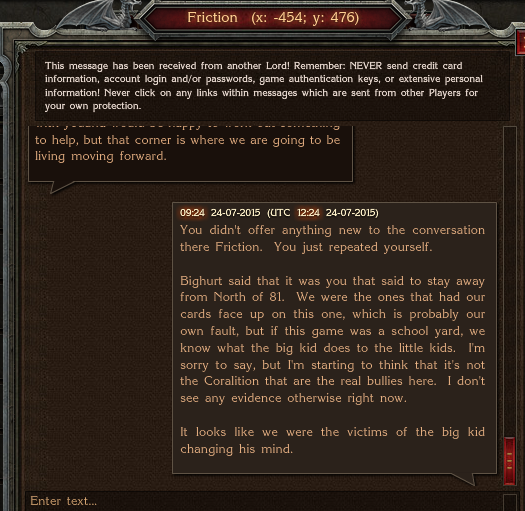 As you can see from the messages posted above, this conversation between the two titans did not go well. The apology by Friction is not accepted by Sir Crusher and the wound cannot be mended. After these actions occurred, it was reported by Sir Crusher that Anarchy did not take the matter lying down: attacks began on KT's settlements and their forces were deployed, striking at their resource production and their troops stationed there. Unfortunately, in these dark times, in these times of war, events such as these are far too common. This war continues on and the collateral damage continues to mount. Who knows when this madness will come to an end? Let us hope that it is soon, before it destroys us all.